So, I survived and I didn't even overeat--relatively speaking. .
Back to Easter. The festivities don't start until the patriarch of the family blesses the table by sprinkling holy water with an olive branch. 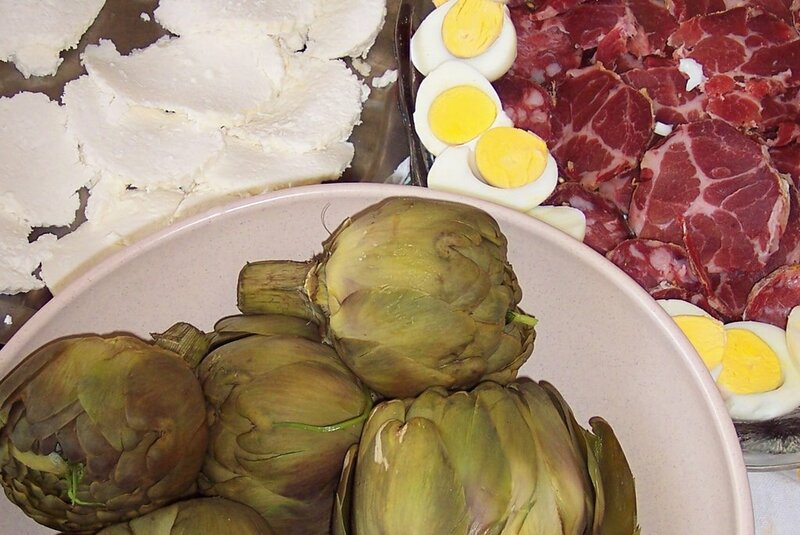 We began the meal with various salami, salted ricotta and boiled eggs, then onto the pasta, which was fettucine tossed with the drippings from the roasted lamb. The poor little lambs were cooked 2 ways: braised with wine and peas, then mixed with raw eggs stirred over the flame until a smooth, clingy sauce formed. The other was roasted in the oven with wine, cherry tomatoes, onions, and lots of olive oil (which formed the sauce for the pasta). The Casatiello is followed by la Pastiera Napoletana, which is like a cheesecake cooked with ricotta, eggs, grain, cinnamon, candied fruit, and orange blossom water all baked in a sweet pate sucree-type crust. The last gasp of the meal is the opening of the colomba (dove). This is a sweet bread (That's right! More bread...) baked in the shape of a dove. If you want to know the history, recipe, etc., click here. When all is said and eaten, bellies distended from too many trips to the feedin' trough, the children in the family open their large chocolate eggs to see what surprise hides in the hollow interior. I must say that Easter in Italy is quite a treat. I miss my family in Texas, and since I can't be with them on this particular holiday, I count myself fortunate to be able to share it with others. Even though I have left my home for a life across the ocean, some things never change. Whether I'm in Texas or Italy, I can always take comfort in the familiarity of ritualistic holiday gluttony. It doesn't matter what continent you are on. . . love for us is expressed by food. 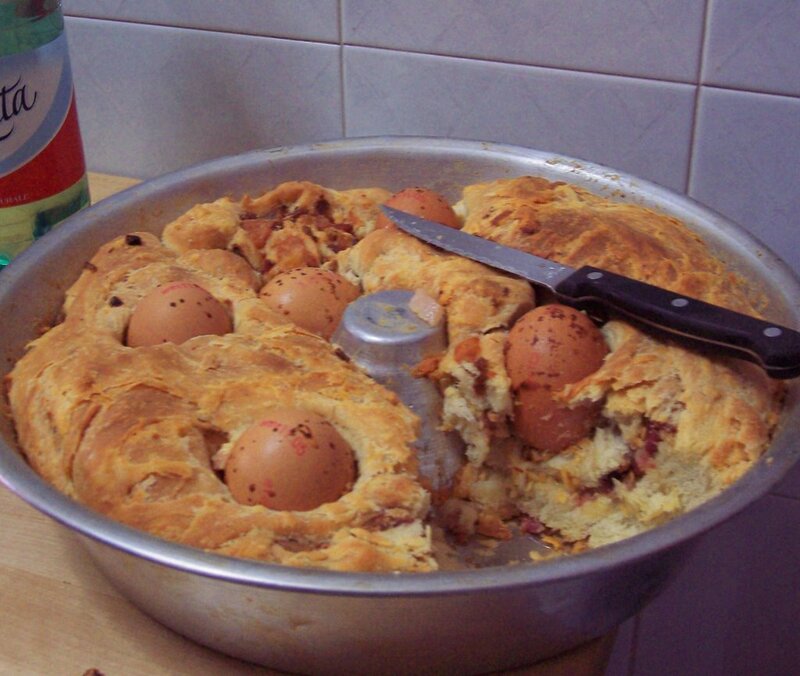 Our tradition is a sweet easter bread with hardboiled easter eggs baked into the bread. The tradition is to make a cross with the dough and place the egg in the bread with the bread dough cross over the top. MMMMMMMMMM I miss those calories the most. Oh that sounds so delicious! Esp. the lamb and the dessert. "lighter palate-cleansing part of the meal" haha. 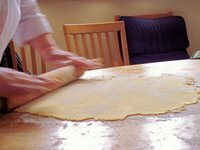 Sounds like eating in Malta - huge plates of pasta (sometimes in a pastry case, in the case of "timpana") as hors d'oeuvres! mmmmmmmthe casatiello looks soooooooo good. Wow. This is pretty darn similar to the Greek Easters I've been celebrating since Gabriel. I'm about to post on the gory whole lamb preparation (vegetarians beware!) 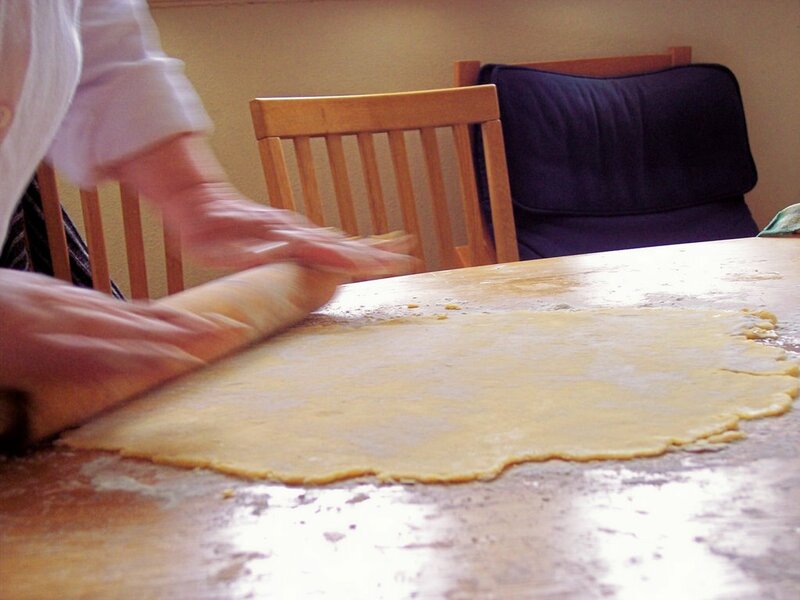 You do the lamb and the Easter egg bread too, even the pastiera is similar to the pasta flora my mother-in-law makes. Did you each take an Easter egg and smash it against the person next to you's egg and then continue until there was only one Easter Egg champion left? Your post brought back memories to this homesick girl. My family is Methodist as well but my dad went to Catholic schools, so Friday was always fish day at our house. On Good Friday we NEVER ate meat. Glad you had a happy easter. The food looks amazing! I could have over eaten easily with food like that! mmm looks yummy! Just because I know you care so much! And just to make your boyfriend so jealous with this piece of information; Steven Segal is playing with his band at the RiverRock Casino in Richmond BC sometime soon. Apparently my sister and her peeps have tickets. Who knew Steven Segals was just an all round talented kind of guy!? All of these dishes look and sound absolutely delicious. I'm glad you had a wonderful Easter holiday. I think I would have exploded. My goodness. To think I spent mine drinking "Belini's" and yes you're right it is a Belini. Reminds me of the blood dripping skinned lamb I saw someone carrying through the the streets of Tirana on Saturday. Ugh. But all those breads and cakes -yumyum! Wow! What a feast! Was all that beautiful food cooked by Gennaro's family? You's a very lucky lady indeed. The Casatiello is also made in Portugal for Easter with whole eggs as well. Funny, i thought it was a purely portuguese tradition. Had some myself this past weekend! Si mangia troppo bene in Italia! useless--STOP THAT! stop that RIGHT NOW. don't you go to mc donalds ever again!! Are you kidding me? I am soooo jealous...I would be in HEAVEN with all that bread! Sounds like you had a wonderfully delicious holiday! Good for you! What a great, mouth-watering post. And the pictures are beautiful - did you shoot all of these? Thanks for visiting my blog. I'm going to forward yours to a friend of mine, an American who lived for many years in Italy and is now living here with her Italian husband. I'm sure it'll make her nostalgic. So how's your stomach feeling today? We had a two day eating fest, Sunday at my husband's parents place, then yesterday at a friend's place. Our friends are originally from Naples, and of course ate WAY TOO much, but in true Italian tradition, everything tasted great! Mmmmm yum....I put on so much weight when I spent 3 months in Italy!! No one does it like the Italians!!! i have GOT to come to naples and explore those culinary delights! recovery must be tough though! yeah yeah, delicious and yummy and yada yada... but all I could think when I read that post was how big is your (their?) refrigerator?! 4 whole lambs?!! I have stumbled upon a post you put on expattalk. I think your blog is hilarious and I had a lot of fun going through your posts. As a reverse expat, not anymore but for several years, your comments on traffic, barefootin', food and life in general in/about the south of Italy. I moved back to Caserta with my wife, French, and for the time being we have an arrangement where we get to see, and dine, often my parents and, gee, have I heard already your type of comments. As I said, it's been hilarious. The food looks SOOOOO good!